Farmer, MLA (1959-1962), MLA (1963-1966). Born at Winnipeg on 4 February 1922, son of George Harrison Hutton and Anna Marie Isaacson, he was educated at Daniel McIntyre Collegiate, St. John’s College, and United College, graduating with a BA in 1950. He farmed 800 acres at Rosser. Elected President of the provincial Progressive Conservative Association in 1958, and defeated in the 1958 provincial general election, he was elected in the 1959 provincial general election. He was subsequently appointed Minister of Agriculture and Conservation (1959-1966). 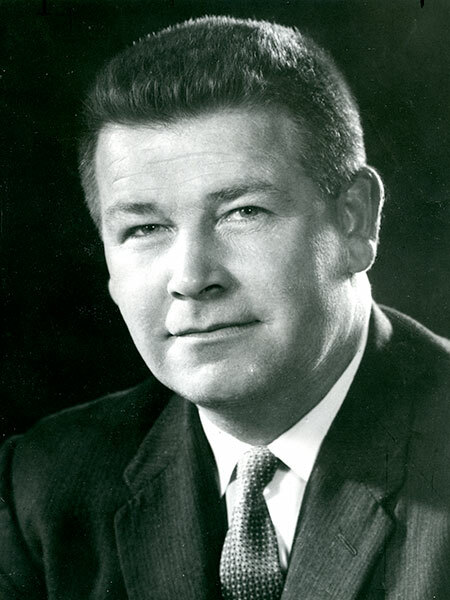 He was largely responsible for piloting the Winnipeg Floodway legislation through the legislature in 1962, being re-elected later that year. He later served in Turkey and India with the Food and Agriculture Organization of the United Nations, and was Deputy Director of the UN World Food Program based at Rome, Italy at the time of his death. On 12 November 1949, he married Elizabeth Sarah Briercliffe (?-? ), daughter of Albany F. Briercliffe of Methven. They had four children: George Hutton, Patricia Hutton, Lynn Hutton, and David Hutton. He served on the Rosser School Board (1952-1957). In 1966, on his retirement from the Manitoba Legislature, he was inducted into the Manitoba Order of the Buffalo Hunt. He died at Rome, Italy on 18 April 1976. “Engagements,” Winnipeg Tribune, 21 October 1949, page 15. “George Hutton dies at age 54 in Rome,” Winnipeg Free Press, 20 April 1976, page 3. Obituary, Winnipeg Free Press, 21 April 1976, page 56. We thank Julie Hutton for providing additional information used here.